You can delegate it to a specific person. You can involve a group of people (two or more) to accomplish the task. This last option requires collaboration – perfect for when the task is complex and requires expertise from a variety of disciplines. Simply put, one person doesn’t have all the information or answers. 1. Set the Tone. As the leader, your role is to be the catalyst for collaboration to take place. As that catalyst, you set the tone for group work to occur. Your people are looking to you to model the behaviors you seek, so pay close attention to what you say as well as what you do. 2. Clarify the Objective. Whenever you bring your people together (either face-to-face or virtually), clarify the overarching goal (if it is one in a series of meetings) as well as the objective(s) and deliverable(s) of that specific meeting. 3. Generate the list of Possibilities. 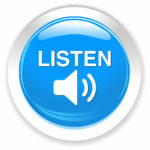 Once you have teed up the topic, problem, or issue, you invite discussion around the topic. Typically, this starts with some form of “listing” the ideas or “brainstorming” new ideas. Synthesize. You can summarize what has been said by synthesizing all the ideas into a handful of headlines or highlights. Sort. You can have the group sort the ideas into a few manageable categories or in a specific flow, for example, chronological, process, along a continuum, and so forth. Prioritize. You can have the group narrow down the pool of ideas into a smaller, prioritized list. Or, you may do a combination of these techniques. For example, first you sort, and then prioritize the categories. 5. Decide Which Ideas to Pursue. Perhaps an obvious option leaps out of the pack and the group comes to a quick decision. Most of the time, however, they are faced with a choice among many options. If the group is interested and has the time, it can combine, create, and synergize the items into a better idea. The group builds a consensus—striving to reach a decision that best reflects the thinking of all of the participants. 6. Take Action. Accountability is even more important in a collaborative session because the group itself owns the result. If there is no action the session is a waste of everyone’s time, so make sure there are some defined action items along with a deadline and the name of at least one person responsible to make it happen. 7. Recognize and Celebrate Success. While there isn’t an “I” in team, there is a “me” – and people like to be recognized for their individual contributions to the whole. Some people like to be recognized publically – and others would prefer you to express your appreciation one-on-one. Regardless, take the time to recognize each individual and their contributions the way they want to be recognized. Keep these seven steps in mind as you bring your team together to achieve astonishing results! 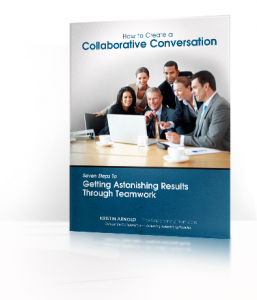 Sign up here for our more extensive report about how to have a collaborative conversation. Posted in Communication, Decision Making, Participation on by Kristin Arnold. ← Summer Newsletter is Now Available!